With the release of U2 iNNOCENCE + eXPERIENCE Live in Paris on June 10th, we have been able to secure a limited number of tickets for an exclusive screening of the film in Paris next Tuesday, 7th June at the Max Linder Theatre. The screening will start at 7.30pm and will be followed by a Q&A session with the film's director Hamish Hamilton and U2 Show Director Willie Williams. To be in with a chance to get a pair of tickets, enter your details in the form below and submit. One pair of tickets per application. Selection is on a first come first served basis. Please be aware that winners will have to organise their own travel and accommodation. If your name is picked, we will be in touch on Sunday 5th June with all the details for Tuesday night. Confirmed RSVPs will receive an email notice 1 to 2 days prior to the event. Admittance to the event is on a first come, first served basis. RSVP does not guarantee entry. Will Call opens at 5:30PM CEST. Thanks for all those that entered for this event. We have contacted those first 125 U2 fans. 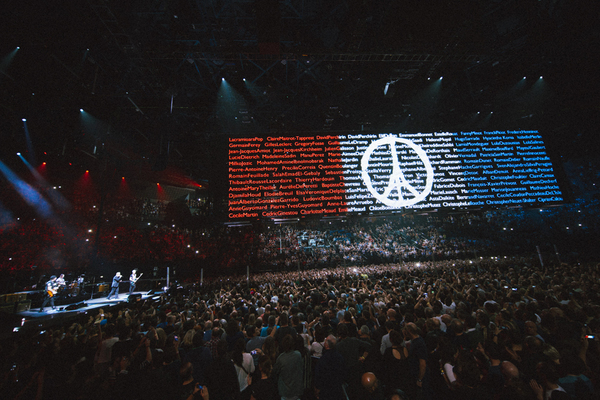 The email will come from upforparis@u2.com – please keep an eye out for this and make sure to check your spam and junk folders. Pre-order U2 iNNOCENCE + eXPERIENCE Live in Paris. Released worldwide on Blu-ray, DVD and digital download on Friday 10th June. Full information, track listing and formats here. I'm one of your great fans and I'm from Iran. I love you guys and your my favourite. I wanted to ask you to sing with Sting again in one of your concerts in IE tour. It will be great. Thanks again for reading this. I am travelling to Paris Tuesday.. I'll enjoy to be part !